Easily charge your computer, support display simultaneously, connect network, mouse, keyboard or transport data with more USB 3.0 devices while this hub is working for your computer. 2. Reader data from hard drive, flash drive via USB 3.0 port. 4. Connect your laptops with external keyboard, mouse or charge your phone via USB 3.0 port. 5. Connect network cable via Ethernet port to experience high speed network. 6. Charge your computer via USB C Female port. 【6-in-1 Multiport Adapter】USB-C converter with 1x 1080p HDMI port, 1x 1080p VGA port, 1x 1000M Ethernet port, 1x USB C Quick Charging port, 2 x 5Gbps USB 3.0 ports. 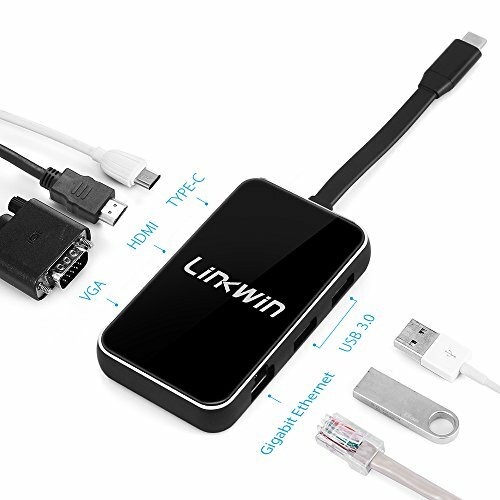 Allow you to simultaneous mirror two big screens, transfer data, power supply, connect network via this USB-C multiport adapter. 【Mac-Style Design】Sleek aluminum and tempered glass design perfectly complements Apple accessories. Flat TPE Tangle-free charging cable applied flexibly. Lightweight, slim and portable, great for traveling and office working. 【Compatible Devices】Compatible with MackBook, MacBook Pro 2016/2017, Chromebook. Chromebook Pixel, Dell, HP and more USB C devices. 【Plug &Play】No driver needed. All ports can work at the same time, make full use of the USB Type-C port on your laptop. 【Buyer Guaranteed】12-month quality assurance and best customer service, please don't hesitate to contact us if you need more helps. If you have any questions about this product by LINKWIN, contact us by completing and submitting the form below. If you are looking for a specif part number, please include it with your message.